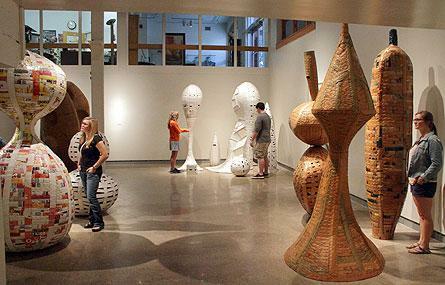 The gallery of the De Pree Art Center at Hope College is hosting “Beauty, Joy, and Wonder: The Sculpture of Ann Weber” through Sept. 28..
Weber will give an artist talk on Friday, Sept. 14, at 4:30 p.m. in Cook Auditorium of the De Pree Art Center, followed by a reception in the gallery at 5 p.m. The public is invited to the exhibition, talk and reception. Admission is free. The De Pree Art Center is located at 160 E. 12th St., on Columbia Avenue at 12th Street. The regular gallery hours are Mondays through Saturdays from 10 a.m. until 5 p.m.; and Sundays from 1 p.m. until 5 p.m. Gallery hours may be reduced during breaks and holidays. The gallery is handicapped accessible. From tracking the ancestry of maple trees worldwide, to studying contamination in the Lake Macatawa Watershed, to a first-year class’s research into a mycobacteriophage, a new bench-top “next-generation” genomic sequencing platform coming to Hope College this fall will find many applications. The exciting Hope/Calvin volleyball rivalry of recent years willcontinue in the upcoming season if the pollsters are correct.